Welcome to the forum! When you have a chance (and assume you wish to), please introduce yourself in the Introductions thread. Petitions for ammonia jars are unique in that you write out the situation as it currently stands and not your desired goal. So if, for example, you wanted to break up a couple, you would write "John Doe and Jane Smith are in a happy relationship with each other". You would then tape that upside down to the inside of your ammonia jar and turn the jar upside down, symbolically turning that situation around. Stating your intentions or praying over your jar will help the spell along, so do take the time to be thoughtful when assembling and working your jar. Remember this for next time. You tape it right side up into the jar so that when you turn the jar upside down, you are symbolically turning that situation around. And of course you know to state your petition in terms of how the situation currently stands (not your desired goal as in other petitions), as you want to turn that around as well. Thankyou Miss Athen.Yes it was a great help. Here is a link to Luck Mojo's Bottle spells and spell bottles. I have moved your post to the thread on Ammonia jars. In the future, do a search of the forum using the little search box in the upper right corner before posting questions like yours. It just makes more work for the moderators. You can read all about Ammonia jars in this thread. For the ammonia jar, you state the situation as it currently is and turn the jar upside down to reverse that situation. So if you want to break up two people, you state that they are in a loving relationship (or words to that effect) and turn it upside down to break up their loving relationship. Keep it in a dark place upside down until you see results. If you want him to not walk away, then you would state that he DOES walk away. This is what I meant by stating the situation as it currently is. Just think of this petition as the opposite of what you want to accomplish, and state it accordingly. You are correct in your petition to stop a divorce, but I would just state it as your husband wanting a divorce, not filing for one. If he hasn't filed, then don't put that language out there. Make sure you are wording your petition from the point of view of what is currently happening (the thing you want to change) and not in terms of your desired goal. For example, if you want David Jones to love you (Mary Doe), but he is in a relationship with Sue Smith, you would write "David Jones is in a happy relationship with Sue Smith" or "David Jones is not in love with Mary Doe" as that is the situation you want to change. Make sense? This is basically what I wrote..on one of my jars..I am broke...the 2nd..#### doesnt want a relationship with me...the 3rd###Doesnt love me anymore..and the 4th #### never takes me out anymore. I wrote as simple as I could of the current situation. Does that sound ok? Hell im sorry I am new here. I made a ammonia jar about a week ago. and followed the directions, my issue is that i live with someone and i was cleaning out my closet. i had to move the jar. do i have to make another jar and if i do can i recycle this jar? I am sorry to have to ask. You did the right thing and all is fine. No need to make anything new. Miss Aida, I hope my username rings a bell to my Job situation from the other LM Job assistance page. I was wondering if this spell will/can work for my situation. Also, I have read and re-read all 7 pages here but am having a hard time writing the situation as it is. Your situation is that you have obstacles preventing you from getting the job at _____. So, you would write: "I am having obstacles preventing me from getting a job at ______"
I don't see why it would not work. Ultimately you will just have to try it and see. Let us now how things turn out! I am thrilled to say that the ammonia spell worked ! It was my first spell. It was to help my friend in another state who was approved for an apartment, then denied it. She really needed a place to live so she could stay at her job. Now she can! I tried to do a crossing spell that I got from someone and want to cry. The person told me to get a jar, put some crossing herbs inside, my pee drops, vinegar, the persons hair, a burned picture ammonia, grave yard dirt, 121 pins. mix it up really well and curse at the jar then read psalms 91 and burn a black candle on top. I just recently found out that you cannot use ammonia and I buried it in the cemetery. I went to find it but couldn't and I will try another time to look. I really wanted to cross this person so is it too late? What if I cannot find the jar at the cemetery? I just F***** up really bad listening to this spell. What can I do? If I tried to do it all over again the correct way would the ammonia jar affect it? I seriously want to cry and I am so disappointed that it actually came from a root worker. Please help me...Almost forgot when I burned the candle, it went out but I relit it. Per our private conversation, another AIRR member and I are trying to remedy this situation for you. I am sorry that you had received this type of advice. it's always best to research things yourself so that when you speak to someone else, you can have the opportunity to question and discuss things In a more confident manner. Not only that, you'll be learning lots from these books. I don't want to ask a repetitive question, but I want to make sure I am wording this correctly. I believe this is saying it as it is and so by reversing it I am saying "he IS my boyfriend again"
I stumbled upon this and I'm intrigued. I do have other work going on and I did get an immediate jump on the situation. You write out your CURRENT SITUATION? This spell is to change the current situation by turning it upside down. You can use full names, as that is traditional in spell work, but it is not essential. Thanks for replying... this is really Return to Me situation and a bit Reconciliation (I behaved badly but just attitude, not cheating or that level), I have both LM oils on hand. SO... my boyfriend "broke up" with me last week. I don't really believe him, not for the long term, but right now I am not living with him (I was a week ago) and he is moving, we were supposed to be moving together. I'm at my moms, I don't NEED to move but I want to continue and live my life with this man. So... I'm trying to do what he asked (taking a break) and do my magic work while I'm waiting. He said no at first (like we're done), then take a break (but didn't mean it/just to shut me up), then take a break but I think he means it now. I got definite movement tonight when I got angry at his dollbaby and he called like 2 minutes later and babbled as if he wanted to impress me with the work he did at the new place, like I'm moving there and wanted me to come over, then didnt, he's confused.... he hadn't contacted me in 3 days... so I don't think it's a lost cause. I think he is starting to really miss me. Just to clarify... I can't seem to edit my other post... I have a new "returntomeloveme" <the circle intention around the names, and he does admittedly love me) petition honey jar going, a dry ingredient spell bottle and apple honey "bottle" that I will bury in a week and the dollbaby, which is completely sewn from his used underpants (I sew/craft), stuffed with "personal" tissue and petition with hairs, herbs. I do have a good amount of strong personal concerns in pretty much everything. I'm just not wanting to cancel anything out by phrasing this incorrectly. I have socks as well, I rolled one towards me with his hair in it, I did not have body part specific hairs though. I bought the HHRM book just for that spell, but it is very useful. When I do my candles on the honey jar I inscribe names and commands onto them and I use menstrual blood on the candles in addition to condition oils. Then the first one is good. I hope things work out for you. It's so mind-boggling when they are so confusing in what they want. Thank you Miss Aida... I will get on it now. I'll post back with results. I found out more things tonight that have changed my feelings a bit, but overall I want to be with him. It's hard to not get angry and upset and all over the place myself! Hi all. I just wanted to make sure about how to target the Ammonia Jar Spell to the person. My thinking is that you write their name (and birthdate if you have it), along with the present situation that you want the opposite of. Any need for personal concerns in the jar as well (if you have them)? If the jar is for yourself...let's say insomnia (which I have now, posting at this time, lol), do you include your name and BD? Also, why the use of white paper, instead of lets say brown wrapping paper, and is it necessary for it to wrap the circumference of the jar or can it just go part way around? Should it just be tapped at the top, or can it be tapped at the bottom too...if only the top - what would the reason be for that? Please don't alter the spell. This is not a spell with personal concerns. It is a spell about a situation, not about a person. I asked some questions for clarification...just like the others have done, and would appreciate a decent reply. I did not say anything about altering a spell...so please do not say I am. However, spells are altered all the time, even Cat says there are a number of ways to do something within reasonable parameters. I missed the first part of your question. Apologies. Thank you for your reply, it helped me to better understand the 'whys'. If I may re-ask one question which I did not word correctly - I am wondering why the paper has to go round the entire circumference. The only reason I can come up with is to hide what is written on it from prying eyes. But if there are no prying eyes, then is it necessary to do this or can it just cover half or three quarters. I just like to understand why something is done to increase my understanding of it. You want to insure that there's no chance of missing anyhting. That's the only way I can explain it. Hello,i wanna use Ammonia jar, with a petition describing the aspects of my financial situation that I'd like to see turned around,does it a good idea ? Let me tell you more : At the end of every month i don't have money,my bank account exceed the overdraft limit,a money stay with me spell work well for me in the past but i still have problems and exeed the overdraft limit each times.The use of Amonia jar is it a good idea ? and does i need to use the amonia bottle from lucky mojo or i just need to take the normal one them use at the stores ? I am looking to do a few ammonia jars and have a few questions. I have read all of the pages but am still a little confused. 1. I know it was asked but not answered. Is it ok to use white mailing labels to write petition on? if it doesn't go al the way around can we use 2? 2. There is confusion as to how the petition should be written so please let me know if these are right. A. For weight loss " I am 50lbs overweight and hate to exercise." I have seen this asked but am confused because we were told to list the situation as it is now which would be the petition above but then I saw repsonses that said no write, " I have lost 50lbs and love to exercise" So which one is right? B. For my business. " My business is very slow. I have an empty book and very little money" Is this ok? I read someone had great success but then I saw someone said not to this this spell for a business? C. For my relationship with my husband, " ________, DOB is cheating on me. He is cold,distant, unloving and not affectionate. He is the worse communicator." Is this right? I have seen posts where people say not to use the word "not" as it is asking for what I do not want but I thought I would write how the situation is so when I flip the bottle , it would have the opposite effect where he would be warm, affectionate, loving and very communicative, am I wrong? Last question, for the bottles for my business and for our relationship, wouldn't I keep them forever to make sure my business is successful and that my husband never cheats? I'm always one for doing spells the way they're written, and this spell specifically calls for the paper to be taped inside. But if you only have mailing labels I bet that would work, as long as it's not so tall that it's not submerged in the ammonia when the jar is turned upside-down. "You write the current situation as it is now." I'd keep the jars until the situation turns around. If you want more help with your specific situations (cheating husband, business), you're welcome to ask more questions in those specific threads. One bottle should be fine, and your petition looks good. The point is to write out the situation as it presently is, so the ammonia can "turn it around." I have been employing this conjure with good and quick results since I discovered it on this forum a year ago. I normally write the situation as it is and the ammonia jar turns it down. One of the most effective petitions was when I was so fed up with a job I had but I did not want to have it anymore. I did not want to continue working there because of the bad environment and the low salary. I wrote the sentence "I work in XXXXXXXX". Two weeks later I was working in other different place. My experience. So I have been doing ammonia jars just last week. I never heard of it until two weeks ago and so I decided to try it. Friday I did a jar. I put I don't have money to do laundry. It was true. My clothes were piling up in the hamper, and disappearing from the closet, and I was down to 3 pairs of underwear. So, I went about life and yesterday morning, I put on the last pair of underwear. I was at church (yes, I attend every Sunday. I go to a metaphysical church that has over 600 members and close to 400 were present yesterday) and I decided to go for a walk, all of a sudden. Well, there was my money to do my laundry on the ground. Perfect, went straight home and washed my sheets, and clothes and everything. Friday, I do a jar, Sunday the spell worked. I feel great. And what I really like is that it was something so simple. I have had great success with the spells I have cast recently that I get from this site. I did a money doubling spell at about 9 am on 11/29. By 2:30, I had the money. And it was so random. This guy handed me the money out of the kindness of his heart. I tried to give it back but he wouldn't take it and then just like that, he was gone. I want to say I had the belief and I did, but really, it was kind of a well let's see what happens. At least, with the ammonia jar it was. I have done money doubling spells so many times. So, that was just like brushing my teeth but the power is there and it works. I encourage you all to believe and try. That child like curiosity will get you far. I recently did a couple ammonia jars concerning my relationship. I did 3 of the ammonia jar spells because I didn't want to have one long confusing petition. I also have an AIRR member doing reconciliation candles and I am currently praying to St Jude to intercede on the situation and I have a hot foot jar to get rid of any stray "love rivals". 1) Is this too much work? 2) Will the 3 ammonia spells cancel each other out or do they compliment each other? 3) Will the 3 ammonia spells, plus the candles, plus the prayers, plus the hot foot jar cancel each other out or do they compliment each other? If you are currently working with an AIRR rootworker, I think you should take this question to them, tell them all the work you're doing on the situation, and see what they think. I don't think your work will necessarily "cancel out" what they're doing, but when you hire a rootworker you want to make sure the two of you are on the same page with what spellwork the two of you are doing, so you can work as a team. 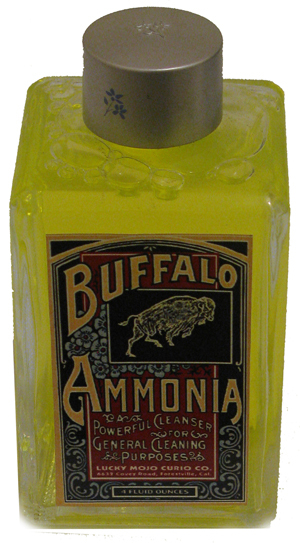 Would francensense increase spiritual power of an ammonia jar spell? I don't think so. I would imagine that the ammonia would wash away the power of it.